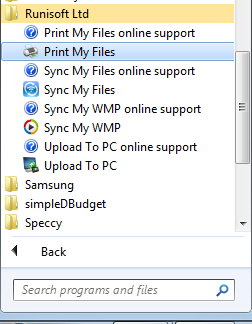 Once the installtion is done,setup will automatically start Print My Files in the system tray.Once it starts in tray,it will display a popup saying "Print My Files started in tray". Double click on the tray icon to open the main window.You can right click on the tray icon to see other options also. You can manually also launch the application.But remember,it starts in the system tray.You need to double click on it to see the main window.